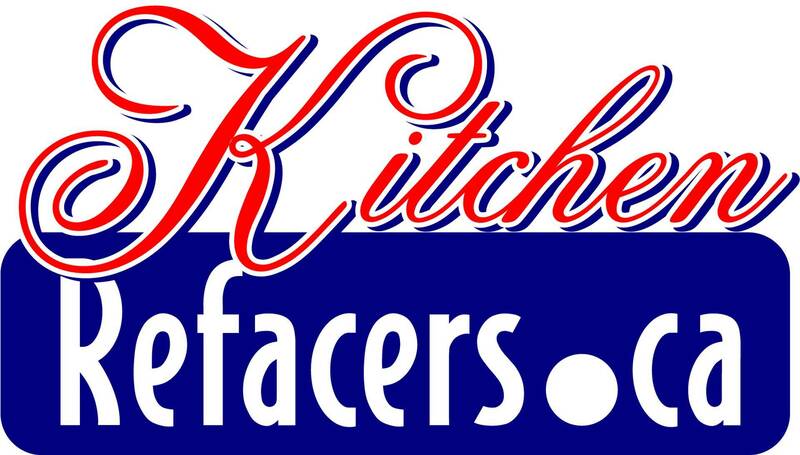 Up to date with Halifax kitchens and cabinet refacing projects in the Halifax, Dartmouth and across Canada. Refer to our home page for the nearest contact. A Kitchen remodeling projects can be a simple kitchen cupboard door replacement, kitchen cabinet painting, to a complete kitchen renovation. Lets make your kitchen makeover a well thought out project done the right way. 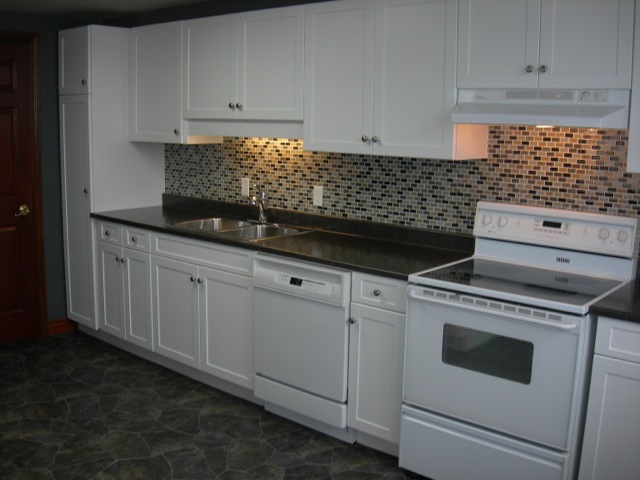 Many request we receive is Kitchen Cabinet Painting in Halifax,Dartmouth area. This example below is an oak style kitchen painted then re-doored with a shaker door. The main advantage of re-dooring is that you are updating the whole kitchen look with a modern looking door instead of the cathedral style door which shows the age of the kitchen. New soft close concealed hinges can be inserted to the new doors. This gives a modern look to your kitchen instead of the outdated expose hinge on some of the kitchens. Customers think by saving and painting the existing doors will keep cost down. We just want our clients to be well informed before they start any kitchen cabinet door painting project. Read what our satisfied clients have to say. Cupboard door up-date that's fast! In this after photo above it took one day for new doors,countertop,and end panel replacement. This is over half the kitchen in this photo. Considering a kitchen cabinet remodel may be as easy as changing your kitchen cupboard doors. When considering doing a cabinet door replacement to your kitchen here are some points to consider. Door hinge and hardware replacement ...A lot of kitchens that I do require a hinge replacement. Usually the kitchen is 15-20 years old and the hinges are showing their age with the squeaks and saging of the doors. We recommend replacing them with a modern soft close hinge system. Put your savings in upgrading your storage.. Just like having a new kitchen you can still add in extra storage devices such as Rollouts, Recycle bins, Lazy Susans, Pots and Pans Drawer just to name a few. In this after photo above it took one day for new cabinet doors, countertop and end panel replacement. This is over half the kitchen shown in this photo. replacement to your kitchen here are some points to consider. The colour is staying the same.. If you are happy with the colour of your existing cabinets but just want to create a new look or style. We have a large selection of PVC doors to match your existing cabinet exteriors. See available PVC Colours Put our savings in upgrading your storage devices such as Rollouts, Recycle bins, Lazy Susans, Pots and Pans Drawer just to name a few. It's just like having a new kitchen. Post your questions and we will reply. Even if your are not ready for a kitchen renovation we are here to give you the right cost saving advice. Often we receive calls about cabinet drawer boxes falling apart, doors saging or in need of adjusting, laminate is peeling off countertops. Simple answer is yes to all questions. In this section post your pictures and commits here. Once we view you information we will call you with recommendations. There are a few options to consider when trying to reuse your existing doors. Are you happy with the existing cabinet colour and the door style? If you are then we remove the cabinet doors and drawer fronts. Bring them back to our shop and give them a cleaning, re-stain any areas needed then re-coat them with a lacquer finish. The cabinets are washed, lightly sanded then re-stained where needed and lacquered. Or are you thinking about painting your cabinets because you are tired of the old worn out finish? There are companies that will take your doors re-spray and re-install them plus re-spray your cabinets. The important thing to remember is how long will the finish last once it is expose to soap, grease, water and handling in the busy section of the kitchen area. Keep in mind when spraying a solid colour on a 5 piece door you will see small hair line cracks on the rail( cross piece) where it joins the style verticle piece. Will YOU be happy with that appearance?HMMMMMM. Just telling you because no one certainly will. Are the cabinet doors going to be properly cleaned and free of the grease that has been deposited for the last 10- 20 year or just sprayed over? Ok now your doors are sprayed. How about those expose hinges? Can they be switched over to a concealed soft close hinge. Provided that the hinge will still allow the proper over-lap. Or is the door the wrong size now. To get the best result is to mask off the walls and spray the cabinets. A good painter knows what it take to do the job right. One bit of good information. When spraying in your home is to make sure all air exchanger vents and returns are closed off. You do not want to have colour pigments circulating in your exchanger or furnace, or the colour you are spraying is going to end up on your furniture for weeks or months to come. kitchen refacing vs New in this project. A lot of kitchen refacing projects that I do are straight forward. This would involve covering the side panels of the wall cabinets and base cabinet. Then Covering the cabinet fronts with the same matching material to match the cabinet door finish. More details to come. We do replace the cabinet hinges along with countertops, trim such as crown moulding and light rail. Modification of cabinets to allow for larger refridgerators or wall mounted microwaves above your stove are common request which are not difficult to do. Here are some points to consider when not to reface. Your kitchen layout is going to be completely changed. For example your sink location or stove location is being moved. Removing a wall. 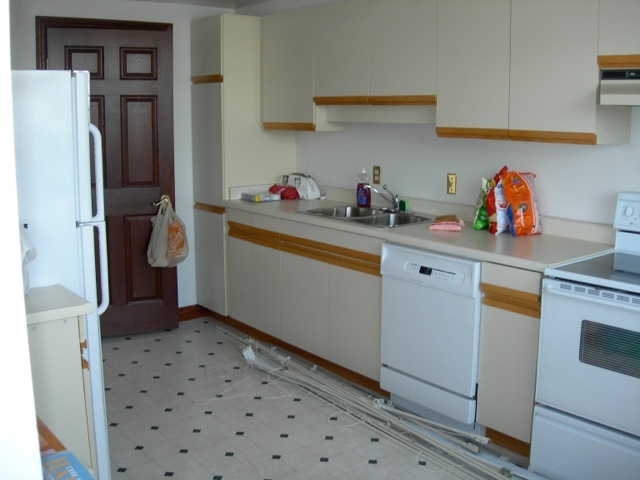 Usually involves the removal of cabinets to increase cabinet space and improve the kitchen layout. The interior of the cabinets is flacking off due to water damage. This is caused from the cups and plates being put back into the cabinets when they are still wet. Usually the particle core is giving off a smell which is a form of dry rot. Kitchen flood. If all the base cabinets are water damage it is difficult to repair. Keep in mind if the walls cabinets are in good shape new base cabinets can be manufactured to match the existing base cabinets. These are the most common situations that we encounter I'm sure there are more. Post your questions here and we will certainly reply. Even if you are not ready for a kitchen renovation we are here to give you the right cost saving advice.